One of the most annoying household problems that assail homeowners are unexpected or sudden leaks that ‘somehow’ just manage to spring out of nowhere! Leaks like these can cost hundreds of dollars and ruin household furnishings. The hassles of even the most minor of repairs caused by small leaks can give any family a headache. Fortunately, there are a number of products available in the market today that can be acquired and readily employed to repair even the most unmanageable of leaks, without the need for professional assistance. Sadly, most of these products tend to be difficult to use, and even more difficult to apply. This is especially true in places that are either extremely hard to reach, or that are otherwise far more damaged than what would otherwise be ideal for repair. Most sealants tend to be made in putty or clay form, and while these may be fine for plugging up holes, it can be somewhat difficult to spread putty or clay-like substances evenly across a large surface area. A better alternative would be to simply find a means to wrap around a leaking area, like a pipe or a tube, evenly without having to clump putty sealant all around it. Now, thanks to modern advancements in technology, a revolutionary type of non-putty-form sealant has been made. EternaBond MicroSealant – a new and wholly innovative sealant in tape form actually changes the entire approach to fixing dripping pipes and tubing. And, it’s effective at covering up gutter holes and other problem areas that may cause leakage. 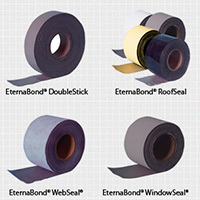 The EternalBond MicroSealant waterproofing tape is especially designed for fast, easy, and precise application, anyone could apply it effectively. EternaBond offers near instantaneous bonding and sealing of all surface types, and may even be applied in the most un-ideal of situations. It’s MicroFibre-made, guaranteeing a super-air-tight solid and thorough seal that effectively blocks the escape of all liquids and gasses, with the added benefit of being strong enough to keep a surface area sealed indefinitely after application. Perfect for the sealing of non-pressurised leaks, it is the best choice available in the market today for a fast, dependable, and wholly durable sealant that only requires a strip-cut-apply method to guarantee a tamperproof seal. It’s amazing stuff! Unlike other sealants that create a solid seal but which tend to dry out or chip, the EternaBond forms a close conforming seal around and/or upon any surface type, effectively creating a seamless seal that is far more durable and lasting than putty or clay-based seals. If you’re looking to achieve effectiveness and quality of a do-it-yourself sealing job, invest in EternaBond – the best waterproofing tape in the market today! Visit their website at https://foamsealant.com.au/eternabond/ for more information.